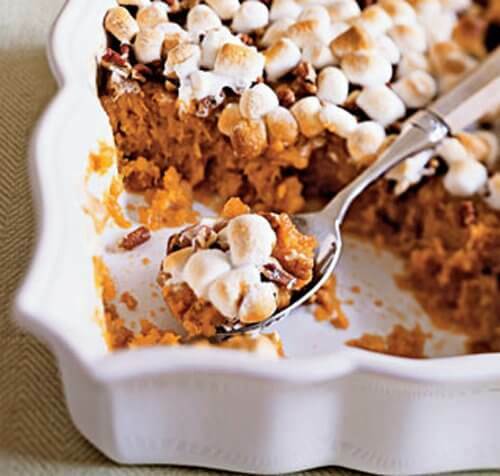 Nothing says classic comfort like Sweet Potato Casserole! This recipe is easy to whip together before a dinner party and is one of our all-time favorites. Typically known for its Thanksgiving appearance, the Sweet Potato Casserole is versatile and can perfectly accompany any weeknight meal with the family. Enjoy with a maple-roasted chicken or turkey, some greens, and voila! But really, how could anyone resist those delicious, toasted marshmallows? In medium bowl, mix the brown sugar and flour. Cut in the butter until the mixture is coarse. Stir in the pecans. Sprinkle the mixture over the marshmallows. Bake 30 minutes, or until the topping is lightly brown.